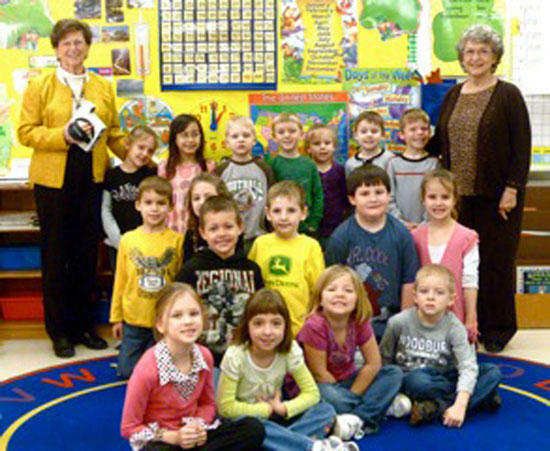 Ms. Alysia Pitts’ kindergarten class at Woodbury Grammar School is one of the many groups of small children screened for vision problems by the Woodbury Lions Club. Front row from left: Maddie Reed, Cheyenne Sissom, Brooklyn Duke, Austin Ferrell, Tucker Kyne. Second row: James Hawkins, Anaston Holt, Tristan Bennett, Hayden Arnold, Ally Gentry. Back row: Lois Larimer holding the SureSight screening instrument, Kenall Hedrick, Ava Houghton, Gunter Pitts, Mason Trammel, Kimberly Johnson, Nick Foster, Ricky Hollis. One of the most important projects the Woodbury Lions Club does is screen the eyes of little children of our county ages 1 to 6 years. This age group cannot read sight checking charts nor can they tell you if they can see clearly if they have never been able to see clearly. By use of a digital instrument called SureSight, potential visual problems are discovered in this age group. Lion Lois Larimer has headed the KidSight screening team in the Woodbury club since its beginning. Each year her team visits daycare centers, preschool classes, and any other place where young children gather, and checks their eyes using the SureSight instrument. This non-invasive screening is possible only if the parent signs a consent form. The results of the screening are sent to Tennessee Lions Eye Center for Children (TLEC) at Vanderbilt. Parents of children indicating a problem are notified and advised to take the child to a local eye doctor. Nearly 5 percent of the more than 325,000 Tennessee children screened by the Lions Clubs since the program started indicated the child has a potential vision problem. More than 65 Cannon County children have been referred to their eye doctor as a result of these screenings. This means that this one project has saved more than 50 of our own children from a lifetime of visual impairment. These children avoided suffering poor vision and possibly lower grades all through school and the rest of their lives thanks to the work of the Lions Club volunteers and the financial support of the public. KidSight Screening got its start when Tennessee Lions raised $4 million and built the Eye Center for Children at Vanderbilt. The Woodbury Club gave $100,000 to this project. Some of this money was earned at such projects as the annual horse show and a sizable portion was contributions of individual members and other generous supporters. The 35 SureSight instruments used for screening children in Tennessee replaced MTI photoscreeners that used Polaroid film. Total expense for all these instruments was well over $175,000 a lot of which was provided by grants from Lions Clubs International Foundation and from the more than 200 Lions clubs in Tennessee. The annual budget for the screening program in Tennessee averages around $200,000. This is raised from grants and gifts, some from various clubs in the state. The state grants a substantial amount each year, recognizing that this project saves the state large sums if the state was doing the screening. Success and low cost of the program is possible because of the volunteer workforce of Lions who are happy to serve and save the vision of children. Key components of the program include early detection, professional referral and assured follow-up. The unique features are that there is no cost to the child and not subject to insurance requirements or waiting periods; and the findings are interpreted by medical professionals at Vanderbilt. Without SightFirst Screening there would be more than 10,000 children in Tennessee with less than desired vision, even some would be blind. Strabismus: when the eyes are not directed to an object at the same time. Anusometropia: a difference in the need for glasses between the two eyes. Astigmatism: Unequal focusing of light rays as they enter the eye, causing a blurring of objects. Media opacity: an object that prevents light from entering the back of the eye such as cataracts.